The battle of Arras lasted thirty-nine days during April and May 1917. Whilst not as well documented as the Somme or Passchendaele, in the opinion of many military historians it was the bloodiest battle of them all measured in terms of the daily casualty rates. Yet it was never meant to be a major battle. 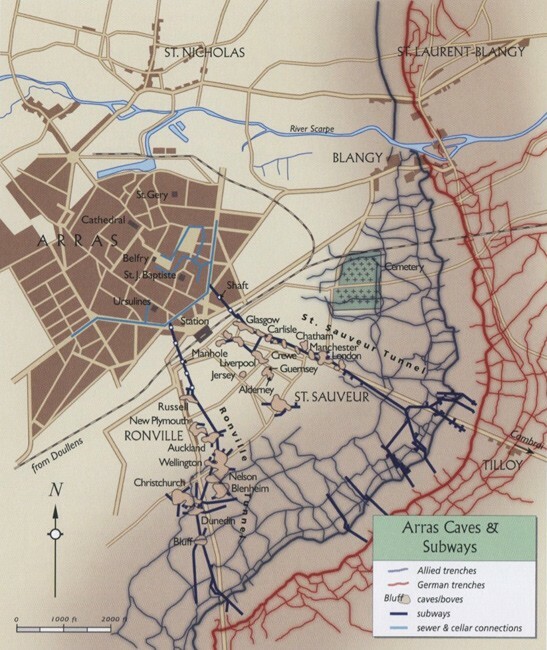 In the Doullens conference of November 1916 at the end of the Somme campaign, Haig had reluctantly agreed to launch an attack in the areas North and South of the city of Arras as a diversionary assault in order to take German attention away from the planned French attack on the Chemin des Dames by General Nivelle. Arras, like Ypres, was a fortified medieval city and by 1916 had effectively become a British city with British law, administration and road signs. The French civilians had been told to leave though some remained to co-habit with the increasing number of soldiers from every corner of the British Empire who were arriving in force in the early part of 1917. 17th (Northern), 18th (Eastern), 29th, 33rd, 37th and 50th (Northumbrian). This is the story of the Battle of Arras from the perspective of these distant relatives. It tells where they came from before Arras, what they did during the battle and what became of them. 2012 is the 95th anniversary of this less well known episode of the Great War, thus an appropriate time to tell the story. My researches have been based upon the War diaries (series WO95) which are readily available in the National Archives in Kew and assisted by the Regimental and Divisional histories, where available, together with the few books that have been written on the Battle of Arras. So who are the main characters in my story? All were brothers or cousins of my grandparents and had either volunteered or had been conscripted into the new armies by 1917. My maternal grandfather George Mason Maltby came from the extended Maltby family of Cambridge. His brother Frank Herbert Maltby had joined the Cambridgeshire regiment in November 1914 and after an extensive period of training was posted to France in August 1916 into the 5th Battalion Yorkshire regiment, The Green Howards. Whether by design or luck, his cousin Samuel R D Maltby, having been called up in August 1914, was in the same Cambridgeshire training unit and thus was also shipped out to France in August 1916 into the same platoon of 5th Battalion Yorkshire regiment. They both survived the later parts of the Somme and in April 1917 found themselves in the Ronville caves awaiting their time to attack. My maternal grandmother came from an extended family of agricultural workers in the village of Felsted outside Chelmsford, the county town of Essex. Her older brother Ernest Jarvis had not enlisted at the outbreak of the war and in fact made no secret of his dislike of the army and fighting. However, like many others, he was conscripted into the army and after a period of training he joined the 8th Battalion Suffolk regiment and fought with them in the later stages of the battle of the Somme including their capture of the Thiepval fortification. By the time of the Battle of Arras, Ernest had been transferred to the 1st Battalion Royal Dublin Fusiliers after a period of leave, during which he had married May Halls in Chelmsford in late November 1916. By April 12th the RDF had reached Arras and were billeted in the Citadel just outside the city centre. Ernest’s cousin Frank Jarvis also lived on the edge of the village of Felsted and at the outbreak of war he was in domestic service. He too had not volunteered in 1914/15 but may have done so in March 1916 or been conscripted. Whatever the circumstance of his enlistment he found himself in a training unit of the Essex regiment before being posted to France in late August 1916 and transferring to the 7th Battalion Border regiment. He too survived the later stages of the Somme and on 10th April 1917 the Borderers arrived in Arras and were billeted in the cellars of the Library museum. Ernest Jarvis had another cousin Wifred Livermore who, although considerably under age, had joined the 9th Battalion Essex regiment and went to France in May 1915. Having fought in the latter stages of the battle of Loos he went into the Machine Gun Corps, 112th MGC and after surviving the Somme, on 7th April 1917 together with the rest of the 37th Division was billeted in Arras. Wilfred had a much older cousin Esther, who had had a son out of wedlock called Albert Livermore though his medal index card mistakenly calls him Alfred. He too had not joined voluntarily, probably because he was married, so that in January 1917 he was called up and joined the 8th Battalion Norfolk regiment. According to their records he appears to have been put into a tunneling company for seven months before being transferred to the infantry in the late summer of 1917. This is likely to have been the 181st R.E. Tunneling company which, by March 1917, had moved into billets at Arras. Ernest Jarvis also had a cousin Percy Livermore who had been born in the Felsted area but by the outbreak of the war was living and working in New Cross S E London. He enlisted into the RFA in late April 1915 and was posted to France as part of the 167th Brigade RFA. Having been transferred to 162nd Bde R.F.A. in the 33rd Division Percy took part extensively in the battle of the Somme and by April 9th was ready to participate in the opening barrage of the Arras offensive. My paternal grandmother came from Somerset and had two brothers both of whom were called up in 1917. One of these brothers, George E Shallish was drafted into the 4th Battalion Worcestershire regiment 29th Division, which by 11th April was in Ronville, Arras. So my eight relatives, together with thousands of other B. E. F. troops, were all awaiting their chance to ‘have a go’ at the enemy. The attack had been scheduled for Easter Sunday, 8th April but was delayed until Easter Monday, 9th April. The Sunday was spent at various holy services, some of which were held in the caves from which the attack would take place. However the weather turned really nasty with snow and cold on 9th April. 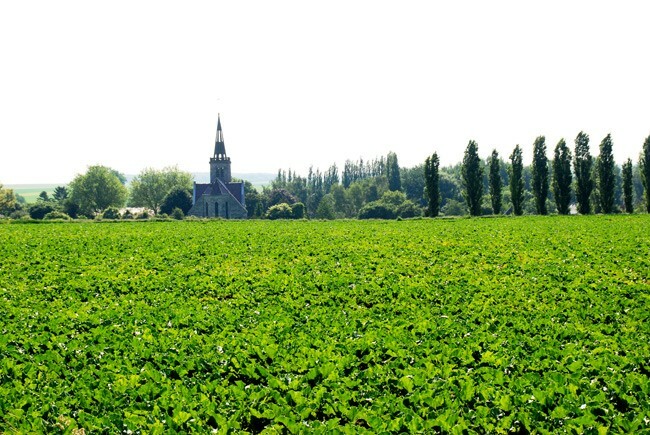 Thus it was that the 37th Division entered the battle with the objective of taking the strongly fortified village of Monchy le Preux. This village was extremely important, for it occupied an elevated position from which the enemy could observe every activity. On 9th April Monchy could not be taken as the enemy machine gun fire from the village of Guemappe south of the Arras Cambrai road was too intense for the attacking forces. 9/4. 7 pm attack on the Brown line was postponed. 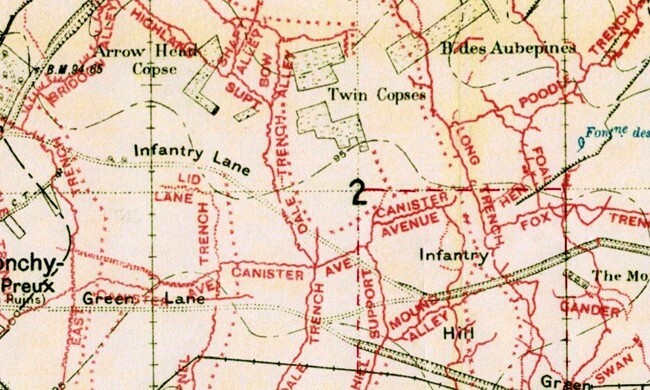 112th MGC moved to within 800 yards of the Brown line astride the Cambrai Road. On 10th April 37th Division was in position around Orange Hill (Fig 3) in preparation to leapfrog the12th Division and to take Monchy. The 111th Bde was to take the village whilst the 112th Bde, including L.Cpl .Wilfred Livermore in the 112th MGC, were on the south flank astride the Cambrai road. There was no creeping barrage when the troops attacked at 10.45 am and so they came under very heavy hostile fire. No real advance was achieved so that men and cavalry horses were left to spend the night out in the open battlefield in frost and snow after which many of both did not survive. 10/4 12 noon attack on Feuchy Chapel began. MGC set up guns on Orange and Chapel Hills to provide support to attacking infantry on Monchy and Guemappe. 30000 rounds fired to 4pm. 5.30 pm The 37th Divisional advance resumed. 9pm 112th Bde returned to its old position at Les Fosses Ferme. The next day, 11th April, was again snowy. The troops were out in the open fields awaiting their orders. It was a crucial day for there was a real chance of defeating the enemy. At 5.00 a.m. 37th Division advanced on Monchy; the 111th Bde were to take the village whilst the 112th advanced along the Arras Cambrai road to protect the flanks. At 7.00 a.m. the 111th entered the village to find it empty of the enemy and met up with units of 15th Division who had attacked from the other side of the village. However, south of Monchy, the village of Guemappe was still occupied by the Germans who poured machine gun fire out onto the 112th Bde. It was at this time that the cavalry entered the battle in force. Some to the south had to dismount under heavy fire and effectively became infantry. The Essex Yeomanry and the 10th Hussars entered Monchy and came under an intense box artillery barrage that resulted in the massacre of five hundred horses, an awful sight of carnage being left in the streets of Monchy for days after. It remains a controversial issue as to why General Buckeley-Johnson, leader of the cavalry, ever decided to charge down Orange Hill, but as he himself was a casualty, we shall never know. 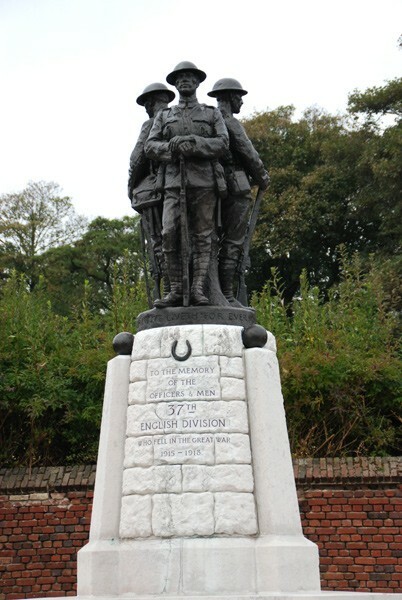 Some argue that without the cavalry’s intervention, Monchy would not have been taken because the 37th Division infantry were exhausted by 11th April. 5 45 am objective gained by 112th MGC , suffered heavily from shell fire and M/G from Guemappe. 2 25 pm. Enemy mounted troops east of Guemappe were scattered. 2 45 pm 112th Bde were counterattacked by the enemy infantry from Guemappe. The counterattack broke down 400 yds from our line and the enemy bolted. 4 45 pm enemy counter attacked again and attempted to dig in. 5 pm Our artillery opened fire and the enemy bolted again. During the counterattack one gun and team were blown to pieces. 7pm . The enemy attacked weakly. Company relieved by 36th MGC . 10 pm The company was collected on Chapel Hill where it remained the night. 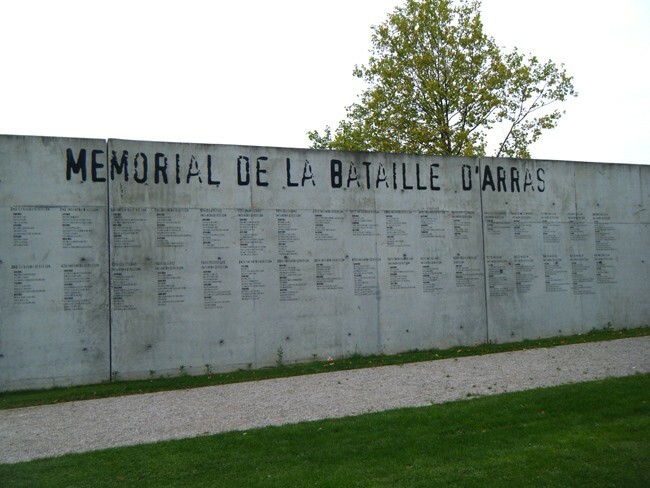 12/4 11 am returned to billets in Arras. During the operations some 50000 rounds were fired. On 12th April fresh B.E.F. units were marched in. The 15th and 37th Divisions were replaced by the 17th and 29th Divisions and the 33rd and 50th Divisions moved in south of the river Scarpe. Lance Corporal Wilfred Livermore and the 112th MGC marched back to Arras and away from the battle zone for rest and recuperation. They would be back. The 29th Division had arrived in Arras on 12th April and was immediately moved into the Monchy sector. Included in this Division was the 4th Bn Worcestershire regiment amongst whose ranks was Private George Shallish from Banwell, Somerset. 6.30pm moved down the Cambrai road to Feuchy Chapel cross roads lead by guides to trenches E of village of La Bergere and S of Monchy Le Preux. 13/4 orders received to prepare for attack at 2pm but cancelled. At 5 30 pm the 3rd Div on our right attacked on a line running from the Cambrai Road to a point S of Guemappe. 14/4 5 30 am the battalion advanced under cover of a barrage and gained their objective. 10 am about 2000 Germans were seen advancing towards us with small parties of our troops retiring before them. The artillery was informed and barrage fire was immediately opened. When the retiring troops had cleared our front we opened fire with rifles and Lewis Guns and the attack was completely shattered by 12 30 pm although the enemy reached a point within 100 yards from our trenches. The 29th Division had been given the task of taking the next objective - Infantry Hill. 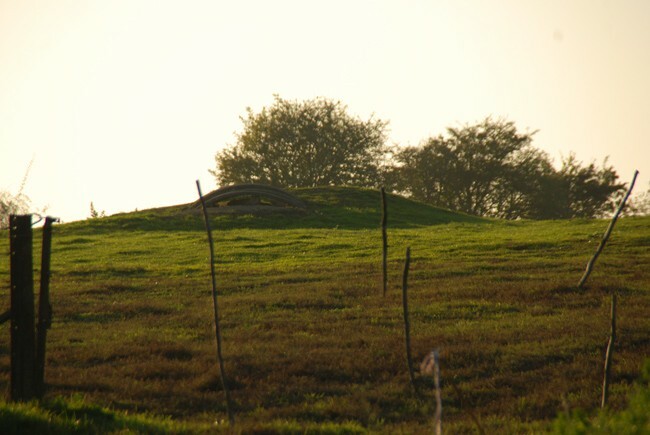 The 1st Essex and the Newfoundlanders attacked and captured the hill. But with no proper support, they were easily driven back by a massive counter attack to the very edge of Monchy, which was only just held through the efforts of the 4th Worcesters and 2nd Hampshires. On 15th the Worcesters were relieved and returned to their billets in Ronville. Also part of the 29th Division was 1st Bn Royal Dublin Fusiliers, which during the early part of 1917, had received over four hundred OR s as reinforcements after the Somme - one of whom was Ernest Jarvis formerly of 8th Bn Suffolk regiment. 12/4 Bn moved from Simoncourt to Arras billeted in the Citadel. Received orders to go into the line tomorrow. 13/4 Bn parades at 6. 45 am and marches to trenches in the old German frontline. 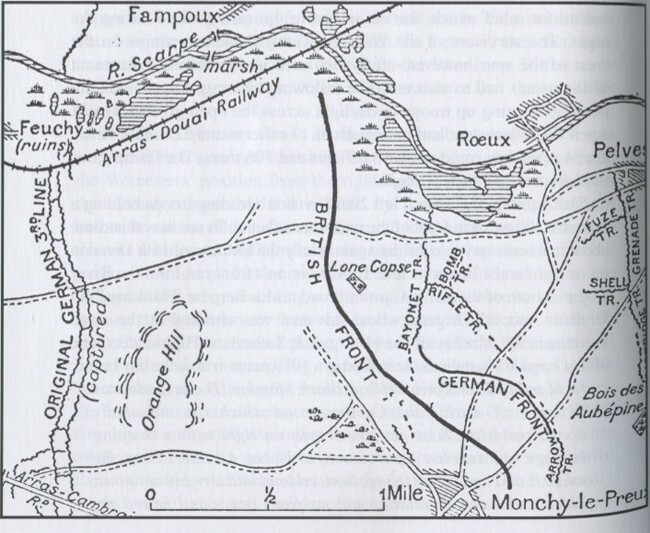 14/4 moved to Brown line as Germans were count-attacking Monchy. Bn not needed consolidated defences of Orange Hill. So, for the time being the 1st RDF was not required to undertake any offensive role and remained out of the front line. Their time would come very shortly. Another reinforcement Division was the 17th (Northern), part of which was the 7th Bn Border regiment including Private Frank Jarvis of Felsted, Essex who had arrived in Arras on 10th April and was billeted in the cellars of the Library Museum with fifty minutes notice to move. However, they were kept in the 51st Brigade reserve before on 13th April moving to Railway Triangle to await their turn. Also kept in reserve was the 5th Bn Yorkshire regiment part of the 50th (Northumbrian) Division. In the 5th Bn were two cousins from Cambridge Privates Frank and Samuel Maltby who on the 12th April marched into Arras to be billeted in the caves that had been transformed into the giant billet by the tunnelers. 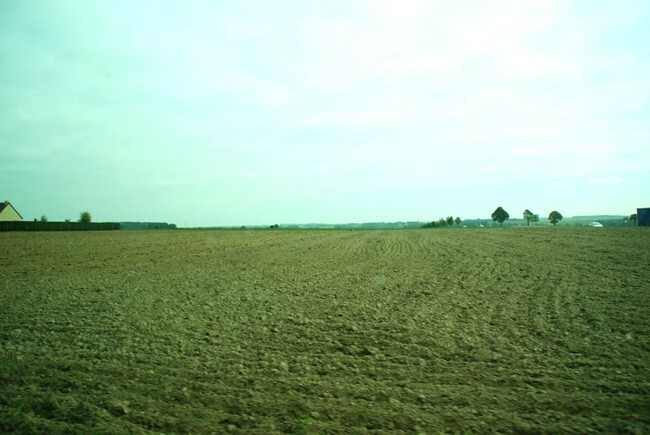 There they remained for the first phase of the Arras battle. 9/4 On 4th, 5th, 6th, 7th, and 8th 33rd and 15th division artilleries bombarded the enemy front opposite that held by 15th Division infantry in preparation for a general aggressive operation. 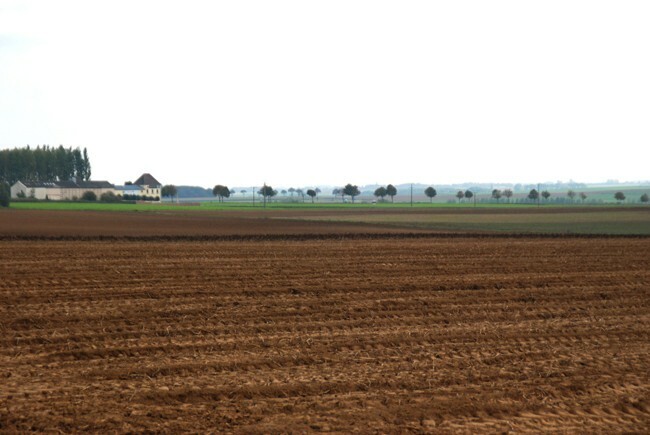 South of Arras the enemy had fallen back to the Hindenburg Line. 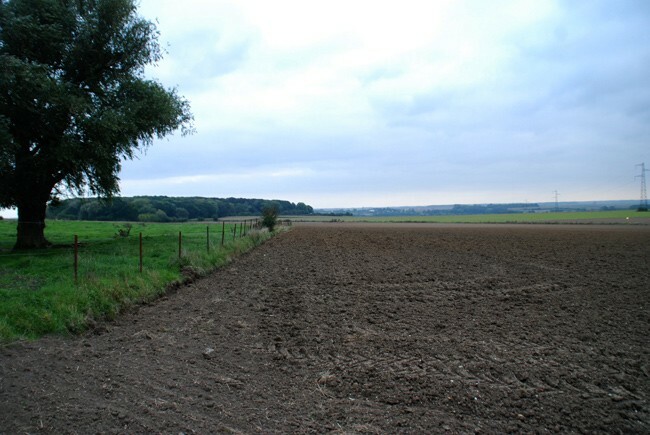 At 5 30 am in a drizzling rain the infantry assault was launched by VIth corps on this front. The German front system which was the first objective was stormed and rapidly carried by the 44th and 45th infantry brigades. The German 2nd system was the 2nd objective and this was also assaulted by the 44th and 45th infantry brigades. Stiff opposition was met at the Railway Triangle 1000 yards E of Blangy where the enemy were bringing strong machine gun fire to bear. Our barrage fire had passed over the embankment without harming the machine gunners. The barrage was brought back towards our troops until it rested exactly over the embankment when every living thing was wiped out. Our batteries directly the 2nd system had fallen advanced by sections to forward positions on the right of the road mid way between Arras and Blangy. A protective barrage of 4 guns per battery was maintained during the advance on the German 3rd system which was finally reached at nightfall the batteries having again advanced to positions near the Railway Triangle. Brigade head quarters occupied a dug out by the bridge of the Railway triangle. 10/4 At 2 30pm orders were received to advance to positions 1000 yards south of Feuchy. Owing to very heavy going of the roads and congestion of traffic, batteries did not get into position until 9am 11th. Hostile fire was very weak. 11/4 37th Div infantry who had been in reserve took up the attack and stormed Monchy Le Preux from the N E and after severe fighting the village was taken. 12/4 HQ moved from the Railway Triangle to an old German gun pit in Feuchy. 13/4 Batteries and wagon lines during the morning were heavily shelled. During the night batteries and H Q wagon lines were heavily gas shelled. Whilst the battle raged, behind the lines the support troops went about their important business. Included in this were the RE Tunneling companies who, as well as opening up the Arras caves, also improved the environment for the infantry. One such group was the 181st RE tunneling company in whose ranks was Private Albert Livermore from Great Leighs, Essex, having been transferred from 8th Bn Norfolk regiment. This RE company had been in Arras since March 19th 1917 and had been renovating the old German trenches after their retirement behind the Hindenburg line. April 1st to 7th Salving timber in villages and old German trenches around Blairville ( S W of ARRAS behind the lines ). Working on HQ for 37th Division in Arras caves. Improving old German dugouts for use as Bn HQ for 56th Division. Tunnel running from Blairville to old German frontline discovered. The first phase of the Battle of Arras ended on 14th April. The opportunity of 9th April’s swift gains had evaporated and some of the Army commanders, notably Allenby, had adopted a very cautious approach with no clear cut battle plan. Haig would dearly have liked to have ended it there and then, but Nivelle had not yet attacked on the Aisne and thus the diversionary Battle of Arras had to be continued. The French offensive on the Aisne commenced at 8 a.m. on 16th April. It failed, so Haig could have closed down the Arras operation. That he did not, is a testament to the muddled thinking of the whole allied command during this phase of the war. Instead he elected to renew the Arras offensive on 23rd April 1917, St George’s Day. Thus it was along the whole of the Arras sector that, one by one, the old and fresh divisions were thrown into the battle. The Germans were totally puzzled by the British plans. They thought that this Battle on a relatively narrow sector of the western front must have the objective of a great breakthrough rather than a battle of attrition and diversion. The break in hostilities had given them time to introduce the new defensive system of ‘elastic defence’ which time and time again caught the British troops in a trap and resulted in higher and higher casualty levels. The War diaries of the various battalions provide the details of how my relatives were engaged in what now became a rather pointless battle of attrition. For some it marked a temporary end to their war, but in two cases it marked the end of their lives. 23/4 ..attack on enemy positions carried out on the whole front of the offensive. 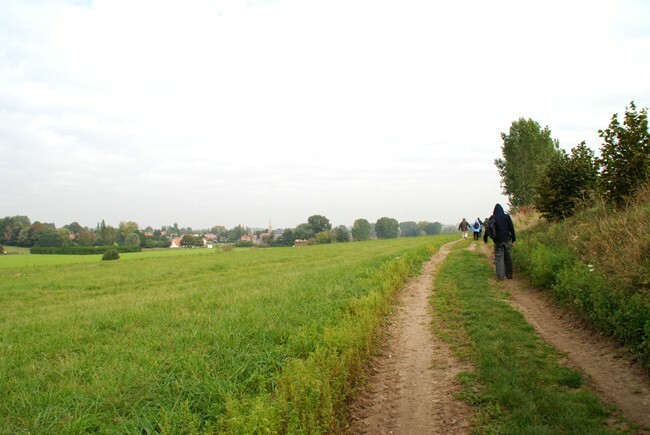 Objective of 51 Bde Blue Line running from E edge of Pelves Village. Preliminary objective is Bayonet Trench. Zero hour was at 4 45 am. At zero hour a standing barrage was put down on Bayonet trench. A creeping barrage began 200 yards west of Bayonet trench and moved at a rate of 3 minutes per 100 yards joining barrage on trench at plus 6 mins. Both barrages lifted at plus 10 and then crept E at rate of 4 mins per 100 yards as far as Blue line. Two tanks were detailed for the attack on Pelves. Bn advanced at zero hour. Right leading coy D lost direction and moved too much to its right striking old German trench. This coy then moved to its left and crossed Bayonet trench an intense MG fire was met from Rifle trench. The remaining men of D coy swung up to the left towards Rifle trench and entered a German strongpoint which they enlarged and consolidated. D coy was joined by survivors of C coy which had crossed Bayonet trench and advanced due E. the left leading Coy A struck Bayonet trench and was met by heavy M G fire from across the River Scarpe and Rifle trench. The left supporting coy B followed and was mown down by M G fire. The survivors of B and A coy retired to the assembly trenches N E of Lone Copse. By that time there were no officers of either coy surviving. The Bn was ordered to move to Railway Triangle about 1 mile E of Arras and Bn HQ with about 100 men, who had come in, started to move at 2.30 am reaching the destination at 4 am. One of the wounded was Frank Jarvis who, after going through the evacuation procedures, eventually found himself in a hospital back in the UK. 23/4 By 4 am Bn formed up in the jumping off trenches. 4 45 am barrage started although it was supposed to fall 200 yds in front of our trench a great many shells dropped in close proximity both in front and to the rear of our trench. 4 45 am Bn advanced under cover of the barrage to the Blue Line. On arrival companies disorganized owing to high percentage of losses of officers and NCOs. 10 am Germans made counter attack which was beaten off mainly by rifle and Lewis gun fire but some of our advanced posts were rounded up. Intense shelling and sniping continued throughout the day. 4 pm another heavy counter attack was launched by the Germans who tried to force their way round the copse. Part of the Z Coy was forced back from in front of the copse but the remainder of the line held good and heavy casualties were inflicted on the enemy. 5pm third attack was attempted by enemy but our S O S signal was answered by the artillery in 30 seconds and the attacking waves were completely broken up. Shortage of flares and ammo was now felt and under extreme difficulties the line was reorganized. Rations were brought up from Fosse Farm 2 limbers and 10 horses were lost by shell fire. 24/4 2 am orders received that the battalion would be relieved by Royal Fusiliers. The relief was completed by dawn. ORs killed 34 missing 53 wounded 325. On relief marched down Cambrai Road to Ronville where the men were given tea and rum and hence to Schramm barracks in Arras. 4 am the Bn was conveyed by motor bus to Simoncourt a distance of 10 miles but owing to congestion of traffic did not arrive until 10 pm. Billeted in huts. 3/5 Owing to operations by 1st, 3rd and 5th armies not being successful as anticipated the Bn was not required. 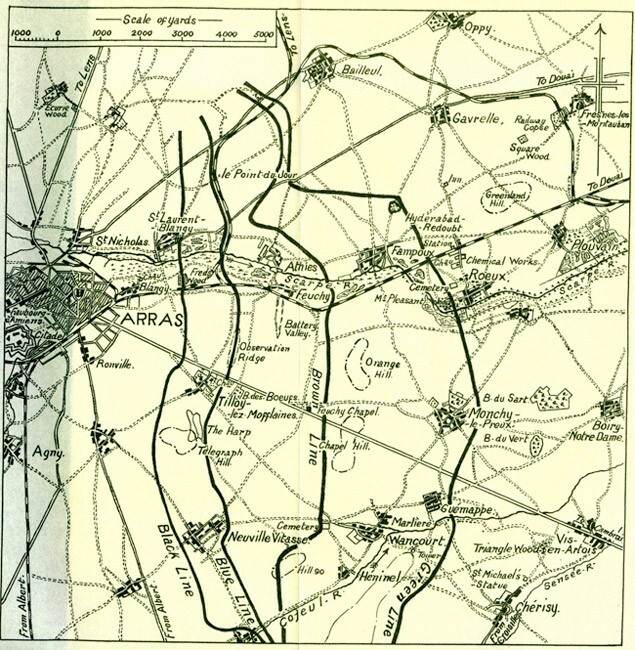 The above description merely confirms that Arras had turned into another battle of attrition with the main objective being the infliction of maximum casualties on both sides and resulted in minimum territorial gains to the allies. Also in the 29th Division was 1st Bn Royal Dublin Fusiliers with Pte 40413 Ernest Jarvis newly transferred from 8th Bn Suffolks. 18/4 Bn moves to Monchy and relieves Lancashire Fusiliers. Village incessantly shelled and extremely dangerous to move about above ground. There are an extraordinary number of dead cavalry horses and men still in the streets but it is impossible to bury them. 21/4 Bn relieved by Lancashire Fusiliers. Bn arrives in Arras at 4 30 pm . Billeted in caves very wet and damp. 23/4 Bn moves up to Brown line at 11 30 am. Orders issued for general attack tomorrow evening. Orders cancelled at 1pm. Battalion to attack Hill 100 at 4 pm. However owing to runner losing his way orders regarding change in time of barrage did not arrive. “Pte Ernest Jarvis Royal Dublin Fusiliers formerly of Chelmsford reported wounded and missing on April 24th 1917 is now reported killed on or about that date. 23rd April 4 45 am Bn moved up to support 4th East Yorks who were attacking. The whole Bn was brought up to meet the counter attack which had succeeded in forcing back our troops to their original front line. Here the Bn held the line until 6 pm when a second attack in conjunction with 151st Bde was carried out. This attack was successful and the line gained was held all night. Casualties ORs 15 killed 118 wounded. 24th April Relieved by 151st Bde moved to trenches in divisional reserve. Relieved in evening by 14th Division. Moved to billets in Arras. 22/4 4. 30 pm Sections moved off at intervals for the Point Du Jour where they were in support. 23/4 4. 45 am No 1 and 3 sections commenced barrage according to programme. This barrage was kept up for 46 minutes. Some 30000 rounds were fired. 10 15 am No 4 section took up position and opened fire on large parties of enemy on Greenland hill firing 20000 rounds when they dispersed. 5 45 pm The three remaining battalions formed up with No 2 section in Hurray trench preparatory to an attack on Greenland Hill. 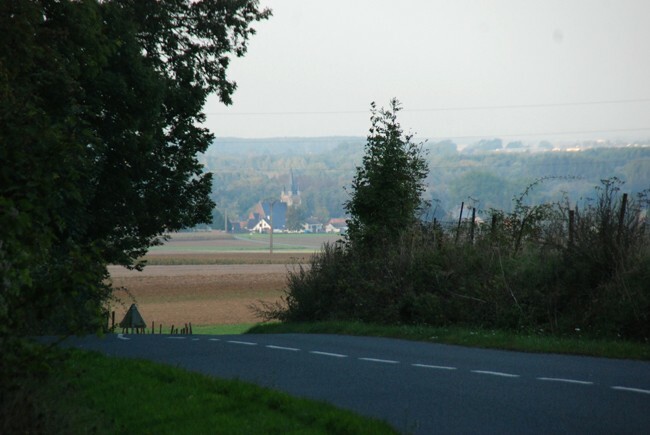 6 pm The 112th Bde had reached the Rouex – Garelle Road and were occupying it. No 2 section was in position protecting the front. 24/4 No 1 section throughout the day fired on parties of the enemy on Greenland Hill. 25/4 7 30 am Both the enemy’s and our signals went up on the right in the direction of Rouex. No 1 section opened barrage fire on South side of Greenland Hill and kept on until about 4 30 pm firing some 12000 rounds. 26/4 During the day no of parties of the enemy appeared. No1 sect fired at enemy’s aeroplanes whenever they appeared. On one occasion plane appeared to be hit. 27/4 4 45 am Barrage fire opened and Bde began to advance . 28/4 12 noon During the day No 3 section moved 2 guns to communication trench firing on the railway embankment and on enemy machine guns on our right flank throughout the day. 12 midnight. From midnight the brigade was relieved with the exception of the Machine Gun Coy. 29/4 The Coy was relieved during the night 29/30 April and arrived in bivouacs by 2pm 30th April. 30/4 Moved by motor bus to billets in Denier. TILLOY During the month the following decorations were received for gallantry in the field. This series of infantry attacks was supported by the RFA. One such Bde was the 162nd in support to the 33rd Division which came into the battle in phase two. Gunner L/20271 Percy Livermore was part of a gun team in 33rd Division Artillery which supported the infantry attacks on 28th April. 28/4 An operation was carried out to capture those portions of Bayonet and Rifle trenches still in the hands of the enemy. The infantry attack began at 4 25 am when 12th and 33rd D A put up a protective barrage. Observations was rendered difficult by mist and shell smoke but at 5 58 am the first objective was reported gained. At 6 40 am owing to the Division on our left being held up a smoke barrage was put down on the south side of the river Scarpe. Early in the day our Howitzers were turned on to troublesome Machine Guns and during the rest of the day the batteries were fully occupied with protective barrage and smashing enemy efforts to mass for counter attacks. The enemy’s artillery opened a light barrage three minutes after our own barrage commenced and at about 7 30 am a heavier barrage was put down on Bayonet Trench but generally speaking hostile shelling was slight until 10 am when things became livelier. It was probably due to the excellence of the work done by FOOs and batteries that the many counter attacks attempted had been smashed before they could come to fruition. On 30th April, Haig met with his army commanders Allenby, Horne and Gough to agree a plan for the next phase of the Arras campaign. This was done in the knowledge that elements of the French army had mutinied - refusing to attack but would defend against any aggression. Two million casualties since 1914 had broken the resolve of the poilus to continue the Generals’ war of attrition. Haig, based upon some over optimistic reports about the lack of German reserves, continued the Arras offensive into May 1917. 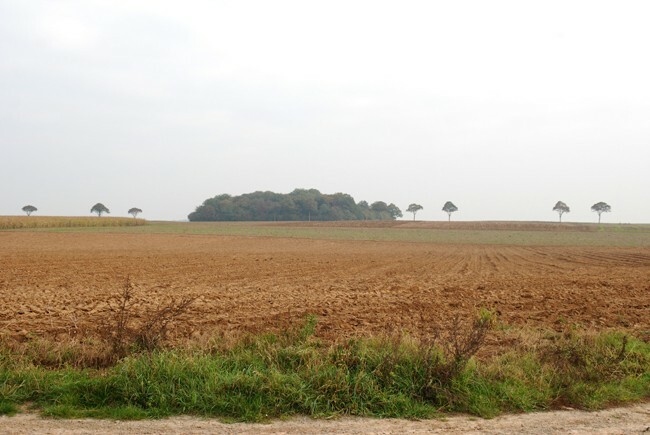 May 3rd attacks continued against the same old objectives of Rouex, Greenland Hill and Bullecourt in the south where the Australians and British took days and suffered huge casualties to take the village - only to lose it. This phase involved fresh divisions so that those previously involved were all rested except the 162nd RFA. 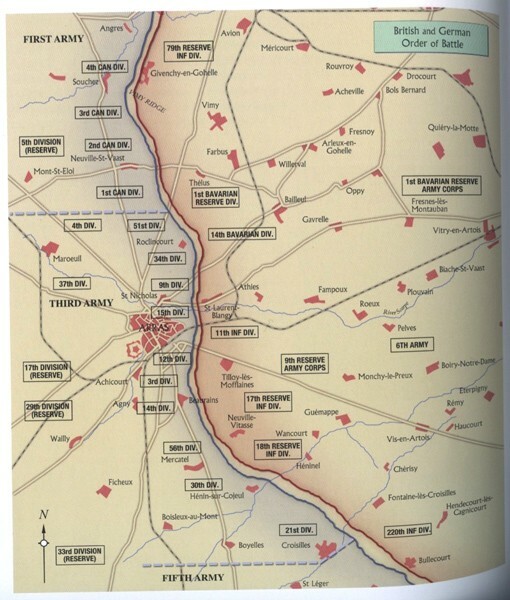 May 3rd 3 45 am 36th and 37th Bdes attacked front between Arleux en Gohelle and Bullecourt supported by 33rd and 12th Divisional artillery. The advance was met by very heavy machine gun fire and an artillery barrage but our front wave succeeded in forcing their way to Gun trench. The 18 pounders kept a protective barrage over the 1st objective to save any infantry who had already reached there. 12 10 pm a new bombardment and attack was organized. About 50 Germans at once ran out of the end of the trench and fled down the bank. Another party estimates about 500 also left the bank and made for the road. Artillery opened on both parties with good results. During the afternoon various targets presented themselves and were dealt with. A good view of counter attacks on the 4th division front were obtained and these attacks were effectively dealt with. The attack was extended northward to the Roeux chemical works yet again. 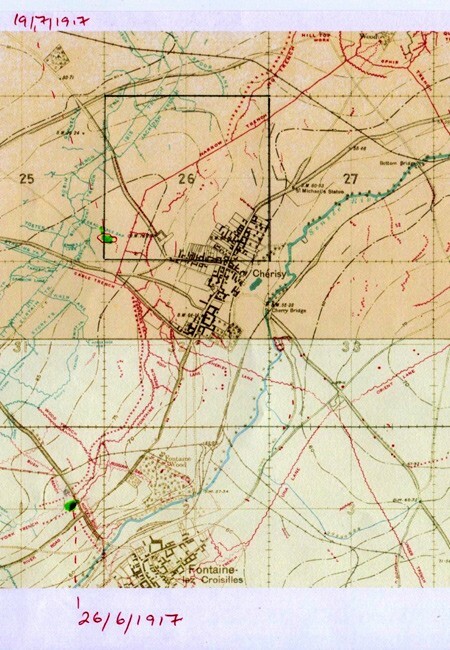 May 11/12th our artillery assisted in an attack made by 4th Division on our left North of the River with the object of taking and holding the Chemical Works and Rouex cemetery. At 7 30 pm we opened a very heavy barrage with a density of 1 18 pounder for every 7 yards of front. May 12/13th At zero artillery put up a barrage on Devil’s Trench. I gun per 10 yards. The attack was held up by heavy machine gun and rifle fire from both flanks. The attack by the 3rd Division on our right was also unsuccessful and by night our infantry occupied their original line. May 19th An attack was carried out to capture Devil’s trench. As soon as our artillery barrage opened the enemy opened very concentrated M G fire. He also put down an effective barrage 30 seconds after ours. Result – line remains unchanged. Gunner Percy Livermore was one of the wounded and was transferred to no 4 General Hospital in Rouen before, in June 1917, he was repatriated to the UK. 20th May Mine at T.6d.10.5 (map ref.) successfully exploded enemy block completely obliterated. No doubt such actions helped the infantry, such as the 5th Yorkshires, to undertake attacks on the German lines. On 17th June 1917, the 5th Yorkshires were moved into the front line west of Fontaine les Croisilles. This type of warfare, such as raiding the enemy’s trenches, continued along the front into the autumn of 1917. 10th July Bde relieved 149 Bde in new right sector. Batt relieved 6th N F in front line W of Cherisy. Relief complete 12 noon Lieut Col C H Pearce wounded. Major J A R Thomson assumed command. 14th 1 am Party of 5 Germans were seen from Otto Sap and fired on. 1 escaped but 3 were taken prisoner. One of the wounded prisoners died shortly after capture. 15th – 17th New front line dug by Pioneers joining heads of Byker and Dead Boche saps. This line was wired by 4th East Yorkshire Regt and 5th Yorkshire Regt. So the Battle of Arras drifted away to be replaced by the Third battle of Ypres, the German Spring Offensive and the Final 100 days. So - what of my relatives whose stories have been told here? 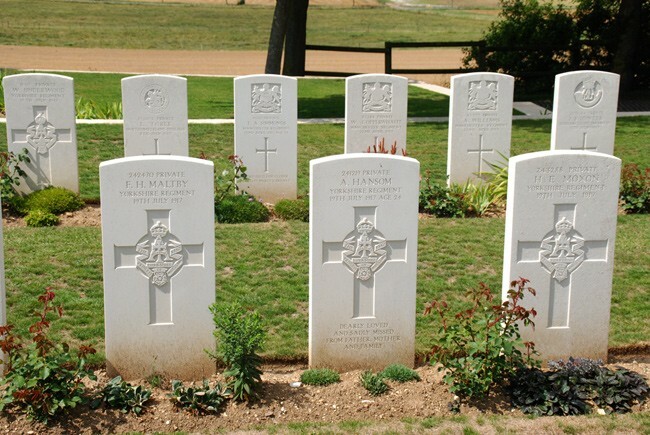 For Frank Maltby and Ernest Jarvis the battle of Arras brought the end of their young lives as they both joined the lengthening list of casualties. Their names live on in the memorials to the “Glorious Dead” created by a grateful nation to ensure that they would never be forgotten. Frank Herbert Maltby the butcher’s boy from Cambridge had his gravestone recently replaced in Heninel Communal Cemetery Extension South of Arras. His name also appears on the War Memorial in the Guildhall in Cambridge, in the Yorkshire Regimental Roll of Honour in Richmond Parish Church and on the WW1 memorial plaques in Ely Cathedral. Ernest Jarvis, former departmental store shop assistant in Chelmsford, has no known grave. 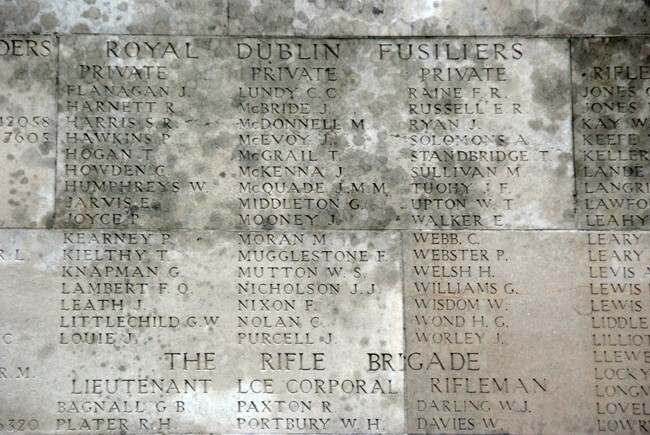 His name appears on a panel of the Arras Memorial to the Missing and on the War Memorial in Chelmsford Cathedral. Furthermore, because he served in the RDF an Irish regiment, he also appears in the beautifully illustrated books of Ireland’s Memorial Record IMR which contain the names of 49,000 men killed in WW1. Wilfred Livermore was promoted to Serjeant in the 40th Bn MGC and wounded and taken prisoner in March 1918 whilst defending the withdrawal of 40th Division during the St Michael German offensive. He died in captivity in May 1918 and is buried in Favreuil British Military Cemetery near to Bapaume. His name is on the War Memorial in his home village of Felsted and on the Rolls of Honour in its two churches. Frank Jarvis recovered from his wounds and returned to the Border regiment. He was killed in action in October 1918 whilst serving with 5th Battalion and is buried in Bellicourt British Cemetery near to St Quentin. He is commemorated on the Border Regiment’s Roll of Honour in Carlisle Cathedral and on the Felsted Village War Memorial and its church Rolls of Honour alongside his cousin Wilfred Livermore. George Shallish continued to serve with the 4th Battalion Worcesters until July 1918 when he was transferred to 9th Gloucesters a Pioneer Battalion until the end of the war. He returned to Somerset where he lived until his death in 1932. 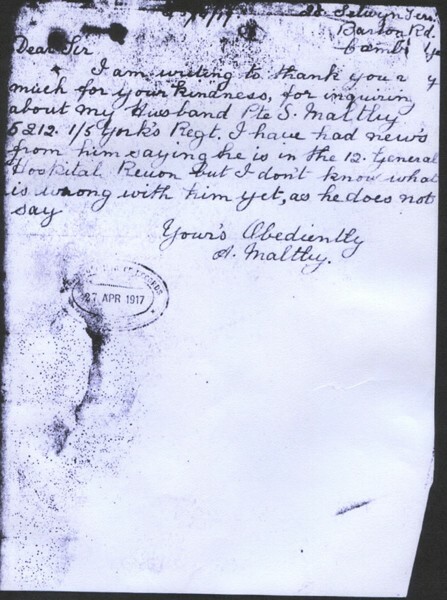 Samuel Maltby returned to 5th Battalion Yorkshires in early 1918 and was taken prisoner in May 1918 . He returned home in December 1918 to his old job at the Cambridge brick works until his death in 1964. Percy Livermore recovered from his wounds and in September 1917 he returned to France but after only one month he was invalided out of the army with tuberculosis. Awarded the Silver War Badge, he died in 1920. Albert Livermore was transferred from the 181st RE Tunneling Company back to the 8th Battalion Norfolk regiment sometime in the autumn of 1917. He was killed in action in October 1917 at the battle of Poelcapelle and is buried in Cement House Cemetery in Belgium and commemorated in the church at Great Leighs Essex. As the 100th anniversary of the Battle of Arras approaches in April 2017, I hope that people will understand its importance in the context of the war and the sacrifices made by my relatives and the thousands of others who lie at peace in the beautiful cemeteries nestling amongst the rolling hills of Artois. Wars throughout time are remembered by the names of the places where significant actions were fought. In WW1, Mons, the Somme, Ypres, Gallipoli, Passchendaele are etched on the tablets of history. Arras should be there too.